Eggplant steak chips? Bet your wondering what in the heck are these right? Well I love Potatoes Steak Fries and always bake them. I also love Eggplant. When I cut it in thick wedges and then flour, bread and bake them they taste so good they never make it to the healthier version. 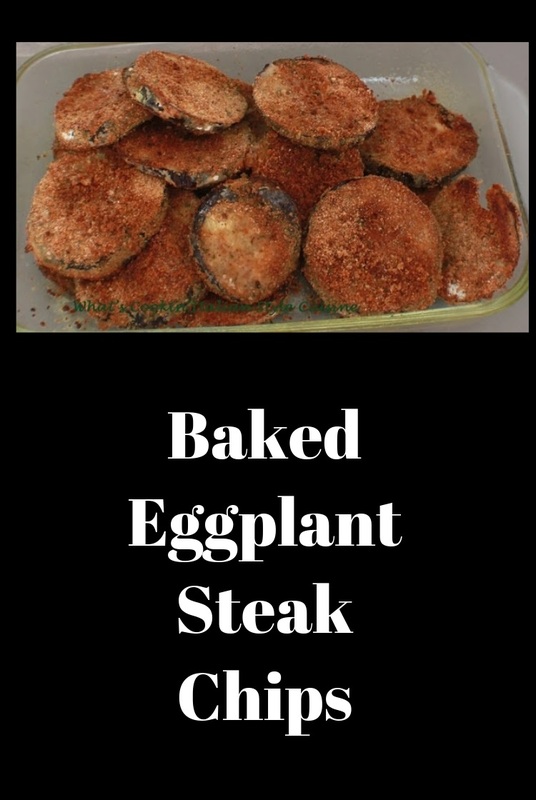 I love these baked Eggplant Parmesan, which was what I really started out to make. Oh sure you can do that too instead if you like and make it with sauce and cheese, but they really taste the eggplant, great without anything else on them or maybe with a little dipping sauce! They can be a fabulous snack or side dish dipped in tomato sauce. When you see the ingredients, you'll agree they sound delicious because they are! Well even if you don't I love them! Plus you can dress they up any way you like! These baked eggplant chips are great plain or topped with sauce and cheese. Slice eggplant leaving skins on and wash in a colander. In a large gallon size plastic bag add 1 cup flour and 1 teaspoon of each salt, pepper, oregano, parsley and dash of cayenne pepper. 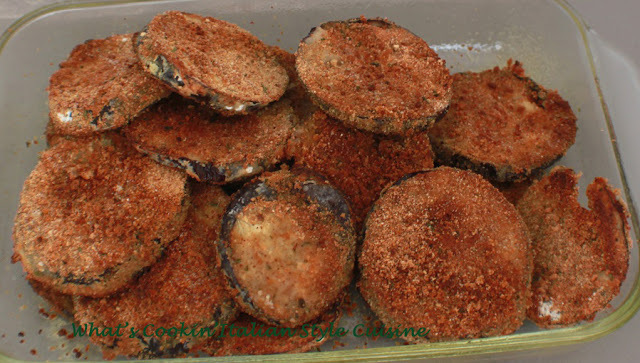 Place and shake the wet washed eggplant slices into the flour. In a pie plate beat the egg whites with water. In another pie plate place 1/2 grating cheese, 1 teaspoon garlic powder and 3 cups Italian flavored bread crumbs in the dish. Dip one eggplant piece at a time into egg wash then into bread crumbs. Place on a large cookie sheet. Continue until all is coated. Drizzle each one with olive oil and sprinkle with more grating cheese. Preheat oven to 400 degrees. Bake around 40 minutes or until very browned and crunchy looking. You can eat them plain or dip them in marinara sauce or whatever else you like. These can also be used to make Eggplant Parmesan adding sauce and mozzarella then baked again.